Insight Theatre Company is opening its 10th season in a new venue, and starting off with a highly regarded, Pulitzer Prize-winning musical, Next to Normal. This small-cast show is an ideal fit for the .Zack in Grand Center. It’s a challenging, highly emotional show with a demanding score, and Insight has assembled an excellent cast, presenting the show in a somewhat different manner than I have seen before, and it works very well. When I first heard of the casting for this production, I was expecting it to be good, especially since the lead role of Diana Goodman would be played by last year’s St. Louis Theater Circle Award winner for Best Actress in a Musical, Debby Lennon. And Lennon isn’t the only seasoned performer in this excellent cast. John Flack as Diana’s husband Dan, Ryan Scott Foizey as the doctors, and Spencer Davis Milford, as the Goodmans’ son Gabe have all done some excellent work in St. Louis theatre. They are joined by extremely promising newcomers Libby Jasper as the Goodmans’ conflicted teenage daughter Natalie, and Max Bahneman as Natalie’s on-again/off-again boyfriend Henry. It’s a story that focuses largely on Diana’s experiences with trying to manage her mental illness and her complicated family relationships, and also on Natalie’s struggle to deal with her own issues involving her family and her future plans. There isn’t a whole lot else I can say without spoiling too much, because this is a show that depends a lot on twists and revelations, although the central family relationships are at its core, with a strong musical score that ranges from more upbeat rock-based numbers to slower, emotional ballads. It’s a challenging work, and when staged well as it is here, it’s riveting. This production is a little different than others I’ve seen, in terms of staging and vocals. Staging-wise, the pacing is a little slower than previous productions, with some of the line-deliveries being a little more subdued. The plot build-up seems to be more gradual as a result, and despite a slow-ish start on “Just Another Day”, the performances are excellent and well-timed. The set, designed by Robbie Ashurst, and the lighting by Charlotte Webster are more colorful as well, with an emphasis on a series of windows of varied hues hanging in the background, and aside from one slightly raised platform, most of the action takes place at stage level, also contrary to other performances I’ve seen. The costumes by Laura Hanson are appropriate and well-suited to the characters, and there’s also excellent musical direction by Ron McGowan, with a slightly different sound reflective of Lennon’s more operatic voice. The cast is excellent, led by Lennon in a sympathetic, emotional performance as Diana, with powerful vocals on songs like “I Missed the Mountains”, “I Dreamed a Dance”, and “You Don’t Know”. Flack is also excellent as Diana’s supportive but increasingly exasperated husband, Dan. His scenes with Lennon carry a lot of power, and he brings a great deal of emotional energy to his songs, especially “I’ve Been” late in Act 1. There are also strong performances from the rich-voiced Jasper as the determined but conflicted Natalie, and by Bahneman as her sweet, persistent stoner boyfriend Henry. Milford is outstanding and full of energy as the dynamic, influential and mysterious Gabe as well, excelling especially on Gabe’s most well-known number “I’m Alive”. There’s also excellent work from Foizey as the two doctors, particularly the “rock star” Doctor Madden, although he does sound a little strained at times. Next to Normal is a powerful, challenging show. It’s a character study as well as a story of relationships, and strong casting and musicality are essential. Those aspects are well represented in this memorable production from Insight Theatre. Although it takes a few minutes to really get going, once it does it’s engaging, fascinating, and highly affecting. It gets Insight’s new season in its new home off to an excellent start. Insight Theatre Company is presenting Next to Normal at the .Zack Theatre until June 25, 2017. 4,000 Miles closes out New Jewish Theatre’s 20th season. Essentially a character study with a slight but intriguing plot, this play emphasizes relationships and lets its audience gradually learn about the characters, as those characters gradually learn to discover truths about themselves. It’s also a strong showcase for its excellent cast. The story starts abruptly, as Leo (Chris Tipp) arrives in the middle of the night at his grandmother’s apartment in New York’s Greenwich Village after a cross-country bike trip. The grandmother, Vera (Amy Loui), is surprised but concerned because nobody had heard from Leo in a while, and she insists he stay the night. At first, Leo says he’s not going to stay long, and Vera doesn’t expect him to, but the days go by, and he doesn’t leave, and over the course of the play we learn more about these characters as they learn to depend on one another in different ways, as the story of Leo is actually here gradually unfolds. The story focuses primarily on the young Leo and the feisty, 91-year-old Vera, although other characters do figure into the story as well, including Leo’s girlfriend from back home who goes to college in New York, Bec (Rachel Fenton), with whom he has a complicated relationship. There’s also Amanda (Grace Langford), a young woman Leo brings home one night, and whose interactions with him reveal even more about his character and his motivations. Mainly, though, this play is about Leo and Vera, and what we learn about both characters and the issues they deal with that are shown as they spend time together. Issues of challenged idealism, loneliness, loss of friends and loved ones, and the simple power of personal relationships are key elements of this play. It’s an intriguing story, but this is more about the characters than the story really, and the end is even more abrupt than the beginning. The performances here are the true highlight of this show. Loui is obviously playing much older than her actual age here, which makes her portrayal all the more impressive in its sheer credibility. It’s easier for a younger performer playing older to exaggerate mannerisms or speech patterns, but Loui doesn’t do that here. In fact, she does an excellent job of making me believe she really is 91. She also brings a believable mix of feistiness and reflection to the role. Her Vera is immensely likable, and her interactions with Tipp are the best part of this show. Tipp, as the initially enigmatic Leo, brings sympathy and charm to his role. His sense of regret is clearly evident in his portrayal, as is his admiration and affection for Vera. There are also strong performances from Fenton as the conflicted Bec, and Langford as Amanda, who makes the most of her short time on stage. Annie Barbour also effectively and poignantly contributes her off-stage voice as a key character who learn about primarily through stories told by the onstage characters. The play’s setting of Vera’s older, rent-controlled Greenwich Village apartment is well-realized here in the detailed scenic design by Marissa Todd. This looks like a real place where a real person lives. Michael Sullivan’s lighting appropriately illuminates the space as well as helping to set the mood for the various moments in the story, and Zoe Sullivan’s sound design is strong as well. The performers are appropriately outfitted by costume designer Michele Friedman Siler, with various small elements in the costuming lending insight into the characters. Laura Skroska’s props also contribute well to the story. My only minor quibble is that Leo’s bicycle looks entirely too clean and shiny at the beginning of the play, when Leo is supposed to have just arrived from a trip across the country. That really is a small issue, though. Otherwise, the technical elements of this play contribute well to the telling of this story. 4,000 Miles is a story of relationship mostly, and regrets and fears, and of the lives that lie ahead for people and the lives and people they’ve left behind, and how those people and experiences can stay with a person whether they are 21 or 91 or somewhere in between. It’s a superbly acted story with a good balance of drama and humor. The ending is a bit strange, as if it stops in the middle of the story, and I’m sure that’s deliberate but I’m not entirely sure if it works. Still, this is a play about the people, and about their connections and interactions and how those relationships shape and influence them. It’s an engaging, intriguing show, and the experience here is worth the trip. This is my introduction to Yentl. It’s a celebrated story by Isaac B. Singer, and an extremely famous movie written by, directed by, and starring Barbra Streisand. The latest production at New Jewish Theatre, however, is the first version of this story that I’ve seen. I knew what the story was about, and I’d seen clips from the Streisand film, but mostly I was going into this production with nothing to compare it to. Maybe that’s better, because I didn’t have to put aside any preconceived notions or compare this cast to the filmed one. This is a different Yentl, anyway, with a score by Jill Sobule rather than by Streisand and with a script by Leah Napolin in collaboration with Singer. At NJT, it’s a thoughtful, thought-provoking look at gender roles, personal identity, and a quest for love and acceptance. The story, set in late 19th Century Poland, follows a studious young Jewish girl, Yentl (Shanara Gabriele) who feels outcast from her own culture because she doesn’t like “girl things” and has aspirations to be a scholar–a role that was traditionally reserved for men. When her loving, reluctantly supportive father (Terry Meddows) dies, Yentl doesn’t feel at home in her village, where she’s expected to find a husband, settle down, and forget about studying. Yentl is determined to learn, though, so she dresses as a boy, leaves her home village, and travels to another so that she will be able to attend yeshiva and study with other young scholars. In this environment, Yentl (now calling herself Anshel) initially thrives, and she forms a close friendship with her study partner Avigdor (Andrew Michael Neiman), although that closeness soon leads to an attraction that confuses them both. Yentl as Anshel also gains a good reputation in the village, attracting the attention of Avigdor’s former fiancee Hadass (Taylor Steward) and her parents (Meddows, Peggy Billo), who are eager for their daughter to marry. Without spoiling too much, I’ll just say that much drama ensues, as Yentl, Avigdor, and Hadass find themselves in difficult and confusing situations that continue to challenge their views of themselves and their culture, as well as threatening to reveal Yentl’s determinedly kept secret. This is an intriguing play that tries to be a lot of things at once, including a drama, a comedy, and a musical. There’s even a Fiddler on the Roof reference thrown in. There’s a critique of gender roles in a society where the separation of men and women leads men to view women as idealized objects, confined to their traditional roles and not expected to learn alongside men. The strictly defined roles are limiting for both the men and the women, but it’s the women who seem to be more restricted. Gabrielle is earnest and engaging as the determined, studious and enigmatic Yentl. She’s got a strong voice and delivers the songs with confidence, as well as effectively portraying Yentl’s love of study and her conflicted feelings for Avigdor, Hadass, and everyone around her. Neiman is energetic and amiable as Avigdor, vividly conveying his idealized love and longing for Hadass as well as his increasingly confusing attachment to Yentl-as-Anshel. The rapport and chemistry between Gabrielle and Neimann is evident, as is the affection and growing sense of suspicion in the relationship between Yentl and Hadass. There are also strong supporting performances, particularly from Jennifer Theby-Quinn as the strong-willed, widowed shopkeeper Pesha, and Meddows as Yentl’s father and also as Alter, Haddass’s father. The show boasts an excellent ensemble of performers–including Peggy Billo, Amy Loui, Will Bonfiglio, Brendan Ochs, Luke Steingruby, and Jack Zanger–playing various roles, from yeshiva students to townspeople, and all do an excellent job. The strong sense of time and place is supported by the excellent, detailed set designed by Peter and Margery Spack. There are also excellent costumes by Michele Friedman Siler and striking lighting by Seth Jackson. The music is well-sung by the cast and expertly performed by musicians Aaron Doerr, Adam Anello, and Dana Hotle, under the direction of music director Charlie Mueller. Yentl at New Jewish Theatre takes the audience back in time, but incisively deals with issues of gender, culture, and faith with memorable music and strongly defined characters. Although sometimes the tone of the songs doesn’t match the tone of the script, for the most part it’s an engaging, thought-provoking journey of discovery and social critique. It’s a fitting play to end a season that’s focused on personal identity, and it’s another reminder of the tradition of excellence on stage at New Jewish Theatre. New Jewish Theatre’s production of Yentl runs until June 5, 2016. “All the world’s a stage”, Shakespeare wrote, but for some people, the stage is their world. Insight Theatre’s latest production, Ken Ludwig’s outrageous backstage farce Moon Over Buffalo, depicts a couple of past-their-prime stage stars for whom show business is their life, although family conflicts and the lure of Hollywood complicate that life. Insight has brought this play to life in a fast-paced, laugh-a-minute production that calls to mind the theatre world of yesteryear while managing to emphasize some timeless themes as well. Backstage at the Erlanger Theatre in Buffalo New York, celebrated stage performers George (Alan Knoll) and Charlotte Hay (Jenni Ryan) are leading a company of actors on the latest stop of a tour. They’re performing two plays in repertory–Edmond Rostand’s Cyrano de Bergerac and Noel Coward’s Private Lives. Their daughter, Rosalind (Sam Auch) used to perform with the troupe but has left showbiz for the “real world”, and returns to visit so she can introduce her parents to her new fiance, star-struck TV weatherman Howard (Will Bonfiglio). That’s only the start of the story. The rest is a comedy of many surprises, involving Rosalind’s ex-boyfriend Paul (Pete Winfrey), who still loves Rosalind; her feisty grandmother Ethel (Tommy Nolan), who rarely remembers her hearing aid; company member Eileen (Kara Overlein), who may or may not be having a fling with George; and Richard (Eric Dean White), the Hays’ lawyer, who is harboring a not-so-secret romantic interest in Charlotte. What follows is a hilarious, slapstick farce involving love triangles, mistaken identity, mixed up performances and costumes, and in a vein similar to another famous backstage comedy, Noises Off, lots of running in and out of doors. It’s a story that doesn’t make a lot of sense if you take it seriously, but fortunately “serious” is about the last word you can use to describe this play–unless of course you mean “seriously funny”, because Moon Over Buffalo certainly is that. The delightful cast has no weak links, and is led by Knoll in a memorable performance as the bombastic, vain George. He’s got the timing down to a science, especially excelling in his drunk scenes. Ryan matches him as the somewhat jaded Charlotte, who seems to be a little more grounded than her husband. Auch is fine as Rosalind, as well, especially pairing well with Winfrey as the still lovestruck Paul. Winfrey has a goofy, energetic charm about him and plays the physical comedy well. There are also strong performances from Nolan as the confrontational Ethel, White as the more subdued Richard, Overlein as the emotional Eileen, and Bonfiglio in a scene-stealing performance as the delightfully goofy Howard. 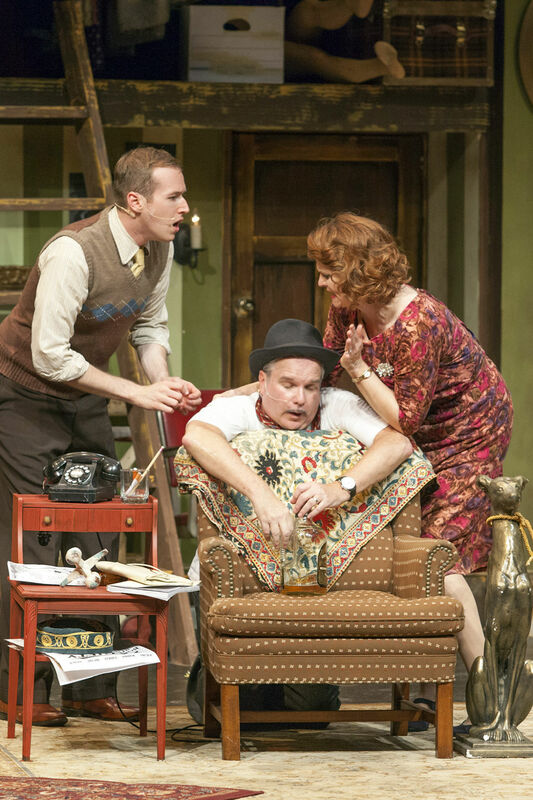 This play depends a great deal on comedic timing, and these players execute that well. There’s a particularly side-splitting section in Act 2 involving a mixed-up stage performance that highlights most of the performers comic abilities and keeps the audience laughing out loud. The scene has been set ideally by means of Peter and Margery Spack’s remarkably detailed set. The backstage of a 1950’s theatre has been meticulously recreated and decorated with all sorts of theatrical paraphernalia and Margery Spack’s excellent period-specific props. The costumes, designed by Erin Reed, are colorful and well-suited, as well, from the 1950s clothes to the theatrical costumes for Cyrano and Private Lives. It’s a very strong technical production, providing the appropriate whimsical atmosphere for the chaotic goings-on of the show. Laughter is the number one goal of a show like this, and Insight’s production achieves that goal with zeal and gusto. It also provides a little window into the world of theatre in the middle of the 20th century, when television was starting to emerge as an important force in entertainment, and films had already become predominant. The main reason for a show like Moon Over Buffalo, though, is to make its audience laugh, and it does that well. It’s a zany, charming farce that holds the audience’s attention from the beginning and holds it until the end. Insight Theatre Company’s Moon Over Buffalo runs at the Heagney Theatre at Nerinx Hall, Webster Groves, until August 9th, 2015.